A top-level chess match will leave us some remarkable games, besides which we hope to hear more beyond the math like a story behind. Therefore, I I had a brief interview with Ju Wenjun’s coach-GM Ni hua who worked as the Chinese men’s team leader for many years and captained the whole team first win the Olympic in 2014. Q:1.How long have you worked together? And in what aspect did you put your effect? A:Nearly two years. She started consulting me at the end of Olympics 2016 and we conducted a formal cooperation before the last stage of Grand Prix at 2016. Then she won the final Grand Prix and got the challenger qualification of Women’s World Championship Match. after that , we started to make preparation focusing on improving her own capability. When Tan Zhongyi won the Woman Championship later, we carried out a more targeted training plan. It lasted almost one year. Q:2.Is there any difference in training between male players and females? A:I’ve been training with GM Yu Yangyi before. That’s a big difference. I trained Ju Wenjun in a very high standard following by the newest information in the world, especially in the opening. So it’s absolutely a tough work . Given that the overall competence of female players is relatively weaker than male’s, Ju Wenjun made much more efforts in training. Q:3.Describing Ju Wenjun in 3-5 words. A:Hard working with strong thirst for knowledge, introverted,low-profile. Q:4.We saw GM Wangyue appears in the playing hall. Is he a member of team? A:Technically, I’m in charge of it. I’m now the main coach of Shanghai chess team, during our cooperation I arranged IM Lou Yiping and IM Xu Yi played with her. Wang Yue was invited for the consulting, not for the specific moves. Q:5.Because this match is actual an internal competition. Do you know their team before Match? A:We heard but we are not sure about it. The most important thing is to do our jobs better. Both Tan Zhongyi and Ju Wenjun plays 1.d4 very often and the opening system they choose are familiar, So Niemzowitsch defence and Catalan opening are the focus on preparation. Q:6.What’s the schedule during the Match? Do you keep working hard? A:Not too much work and preparation during the Match, just reviewing what we worked before. Relieve the stress and keep her in a fighting state. I required her to fight in every move every corner of the chess board from the very first move of the match. Q:7.In the second game, Tan Zhongyi said she was not familiar with that variation in the very beginning. Are you surprised and how did you prepared? A:Ju Wenjun used to play 1...Nf6 and 2...e6 against 1.c4. But we learned a lot from GM Anand and GM Caruana. The British opening 1...e5 was been elaborately prepared, Ju Wenjun never played before this match. But I’m still surprised that Tan Zhongyi lost the way in few moves. Q:8.When did you start feeling confident? And what was the most difficult time? A:I felt confident after the first game. I’m not worry about her skill, time control is the only thing I worry about. I’m glad to see she’s doing better and better. Q:9.Will you continue to collaborate after this Match? A:I need rest. A long time. Basically we won’t be working together like this time. Both Ju Wenjun and me belongs to Shanghai team . we are the team playing Chinese League and we got the champion many times .As the coach I have the duty to help everyone in the team. She’s the most important member. Q:10.What’s your main work and personally goal in the future? A:About the present work, I ‘ve mentioned just now .In the future I want to do more real things for chess popularity. Shang Hai is a international metropolis with big potential for chess development. I wish I could have chance to do my contribution for world chess. 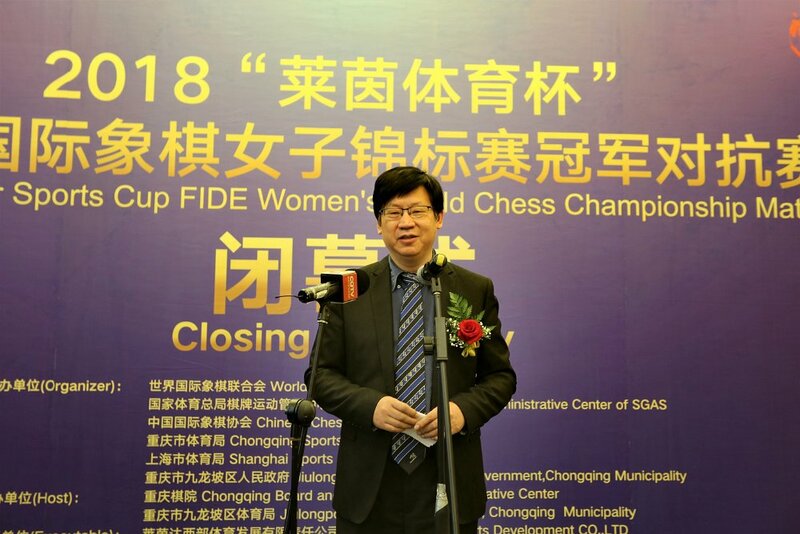 19th May 2018 FIDE Women’s World Chess Championship Match has completed in Jiulongpo Suburb ChongQing. In the last 17 days, been through 10 fierce battles, the challanger Ju Wenjun 5.5: 4.5 defeated the defending champion Tan Zhongyi, became the new champion of FIDE women’s world chess. She is the 17th champion in the word, and she is the 6th in China. 19th May on the closing ceremony, Vice-president of the FIDE Boris Kutin, President of China Chess Association Yang Jun’an, deputy-director of the China National general administration of sports chess sports management center、Vice-president of the China chess association、Coach of the China national team Ye Jiangchuan, director of the China National general administration of sports chess sports management center Chess office、secretary general of the China chess association Tian Hongwei, and Chongqing city Leaders attended the ceremony. 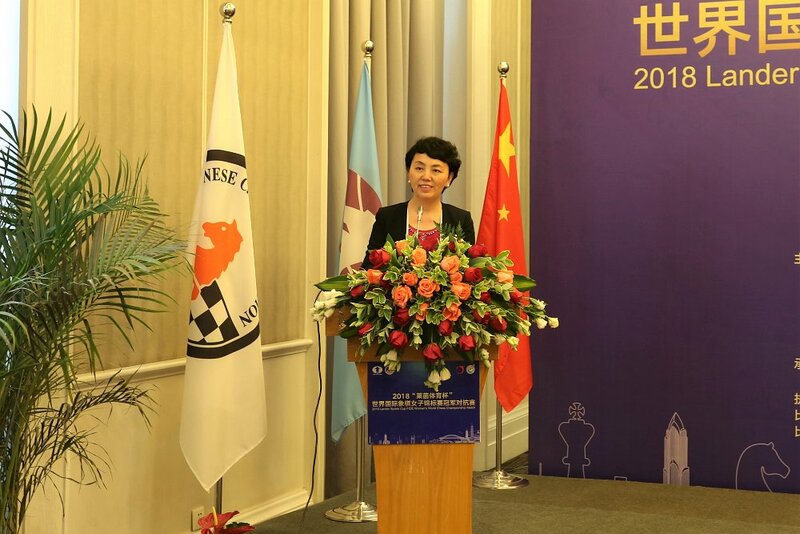 Boris Kutin and Ye Jiangchuan represent FIDE and China Chess Association gave a speech on the ceremony, to give their congratulations to the Ju Wenjun, and affirm the Chinese Players’ outstanding achievements. Kutin says he has been to China seven times and loves China. Chongqing is such a beautiful city. Ju Wenjun gave her speech on the ceremony, she says, it was a tough journey, she feels happy got the final victory. Be a professional chess player, for her it is a satisfactory moment. She appreciates everyone who worked hard for this match. Thanks to Shanghai team coach WGM Wang Pin for being accompany, thanks to her coach GM Ni Hua’s support and hard works in the last two years, and thanks to her mother. 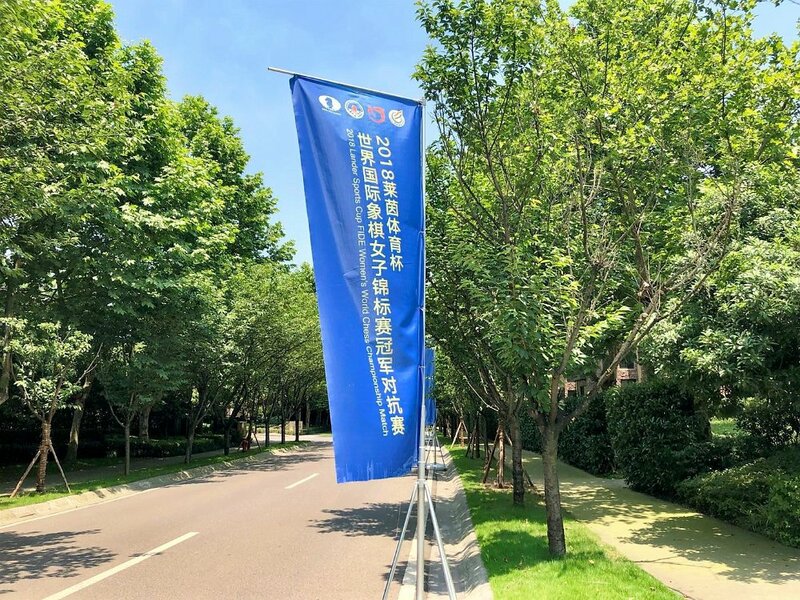 This match is managed by FIDE, China National general administration of sports chess sports management center, China Chess Association, Chongqing Sports bureau, People’s government of Jiulongpo Suburb Choongqing. This match is organized by Chongqing Chess Institute and Chongqing Jiulongpo Sports bureau. And it is co-organized and sponsored by Laiyin Sports. The tenth game of the Women’s World Chess Championship Match finished with a draw game and with the final score 4.5-5.5.the challenger Ju Wenjun became the new Women’s World Champion. After the 9th game， Ju Wenjun has got the match point, 0.5 score to win the match. It is a difficult task for the current champion Tan Zhongyi, to win is the only way so can bring the match to tie-break. Ju Wenjun played white today, she started with 1.d4, Tan Zhongyi reacted with unusual replies intend to bring the game to a complex middle game without opening preparation. Ju Wenjun played solid and keep the slightly advantage. In the middle game, Tan Zhongyi played 19…g5 intend to fight in the king side. However it looks a little bit overhasty. That didn't scare Ju Wenjun, she reacted to it actively. Quickly she had a pawn up, and got herself in advantage. Only 0.5 Score to reach the champion so Ju Wenjun’s later moves were quite simple without any fight. In the end, 4hours 10 minute, Ju Wenjun was in advantage, accepted Tan Zhongyi’s draw suggestion to end the game. At the post game conference, the two players analyzed the game. In both their opinion, 19…g5 was a dubious move, but Tan Zhongyi said that she had to fight to win due to the score situation, so she had no choice but give it a go. Mr. Ye Jiangchuan, the coach of Chinese national team, attended today’s conference, in his opinion, g5 was moved in a wrong time, 19...Nf6 could be a better choice back to that time, and then can wait for better opportunities. Ju Wenjun said it was a task for her when after 19...g5, whether go 20.h4 to make the position complicated or not to, eventually she decided to accept the fight with 20.h4. And at the end, she knew she was in big advantage, but draw doesn't affect her to win this championship match, so accepted Tan Zhongyi’s draw suggestion. In the following interview section, both two players expressed their gratitude to their team, their hometown leaders, friends, family and fans. Ju Wenjun gave her special thanks to her coach GM Ni Hua for so much support, Tan Zhongyi said her coach GM Zhou Weiqi worked harder than her from match preparation to end. Even though she didn't win, but looking forward for future cooperation. Not too much regret to today’s game, problem is that she played terrible in the second and third games in Shanghai. Because psychological and mentally both got kind of “hurt”, she prefers the knockout system like World championship. Ju Wenjun said, be a chess player, she got the chance so just focus and play, didn't concern win or lose before this championship. And she of course is happy with the victory. The most difficult moment was 7th game. Because 6 hours fierce battle in 6th game, that cost too much physical power, and then lost, was in a really bad mood too. So the 7th game is extremely hard. The good thing is, adjusted the state in time. Mr. Ye Jiangchuan says, it was a fierce competition. 10 games, is a completion of chess skills, Psychology and volition. Ju Wenjun showed us her strong ability of controlling; her score was leading ahead all the time. Tan Zhongyi never gave up, she always fought hard. Anyway, Congratulations to Ju Wenjun. Apart from that, he understands the stress, but it is a happy thing to have the opportunity. Hope two girls can keep working hard. After then it was relaxed question section, When Ju Wenjun was asked, why never seen her do make up during the mach, and cloth never changed, she loves pretty in normal day. She said, when she does make up, she does it carefully, but was nervous during the match, so decided not to. And about the cloth, because the cloth is from the sponsor, She believes should wear it, so she wore it. Everyday’s cloth looks the same because she has two sets. Tan Zhongyi says she loves wearing lipstick everyday. So now, the winner of 2018 FIDE women’s world chess championship match has born. After 10 games, Ju Wenjun 5.5: 4.5 Tan Zhongyi becomes the 17th champion of FIDE women’s world chess. 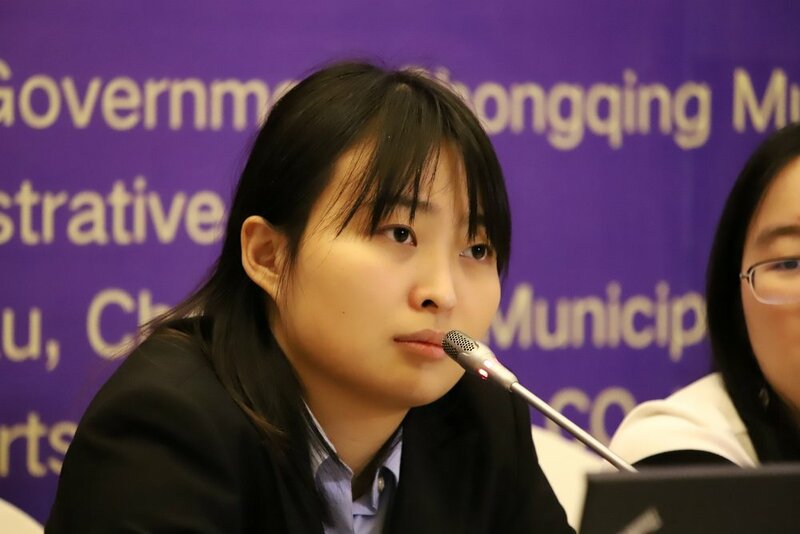 Also she is the 6th Chinese female chess player who reached FIDE chess champion.According to rule, she will get the winning prize, 120,000 Euros (After tax), it is approximately 900,000RMB. Tan Zhongy will get prize of 80,000 Euros (After tax). Tomorrow we will have the closing ceremony. 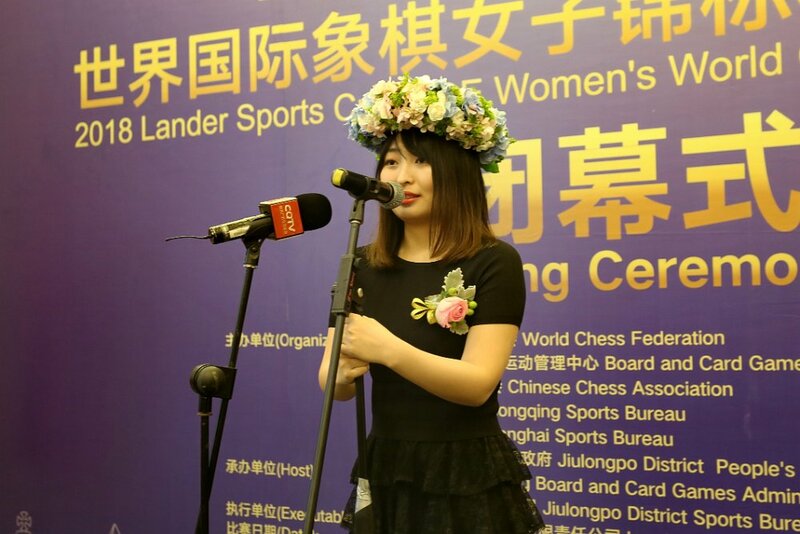 2018 FIDE women’s world chess championship match had the 9th game inside Chongqing Sun Kingdom Hotel on 16th may. After 6 hours fierce battle, the challenger Ju Wenjun and the current champion Tan Zhongyi draw in a interesting ending. So till up, there is one more game to go, Ju Wenjun is 5:4 leading ahead. Tan Zhongyi played white today, started with 1.d4, Ju Wenjun reacted with Nimzowitsch defence again, and later went in a rarely used way to get out from Tan Zhongyi’s opening preparation. So at 11th move, even knew 11.Nxd2 will give white more chance to fight, but Tan Zhongyi still decided to go in a moderate way 11.Qxd2. That brought the game to a balanced ending. Until the white played 33.Rd4, that is considered as a dubious move, in Ju Wenjun’s opinion, said at the post game conference. Because that gave the black an opportunity to gain advantage. White should go 33.Rd1 instead. If that was the case, the game could possibly end up with 33...Rg2+ 34.Rd2 Rg1 35.Rd1draw. Tan Zhongyi agreed with that. She laughed and said, She thought 33.Rd4 and 33.Rd1 are the same, and just somehow she forgot 33…Rf1. After then, Ju Wenjun was in advantage with two pawns up. In the rook and two pawns against Rook ending however, a special case appeared, the Black King was located in a inproper place, so in practice the Black could not win. Tan Zhongyi reacted right. Game end up with a draw. Chess Fans including some professional audiences, were in a cold sweat for Tan Zhongyi, meanwhile was preparing to celebrate for Ju Wenjun. These two chess players were cool in the game. At the post game conference, Tan Zhongyi says she knew she was in disadvantage, but she felt she can save this ending after 45.e4. Ju Wenjun says she knew that she has big chance but may not be able to win. In fact, Black missed an unapparent chance. As GM Ni Hua says, if the Black goes 40…h4 rather than took b2 pawn , could have the most possibility to win. But it is hard to make this choice in a real game, when people have the chance to gain a pawn, why not? Now the suspense is leaving to the last minute. Tomorrow is the last break day in this match. 3:00pm 18th May will be having the last game. 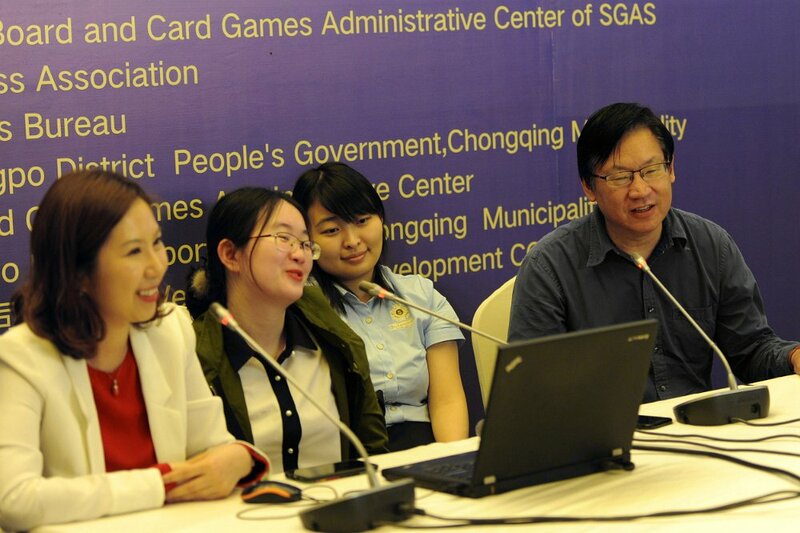 Yu Shaoteng, the Coach of China National Female Chess team, he has been with Chinese Chess players to varies of finals. He says, He went three time with Hou Yifan to attend FIDE women’s world chess championship match, and the results came out after 7 games, 8 games and 9games. So for him , this is also the first time the FIDE women’s world chess championship match needs the 10th game to get the result, the finally fight. They are both Chinese Players, so he can sit back and relax, enjoy their excellent game. 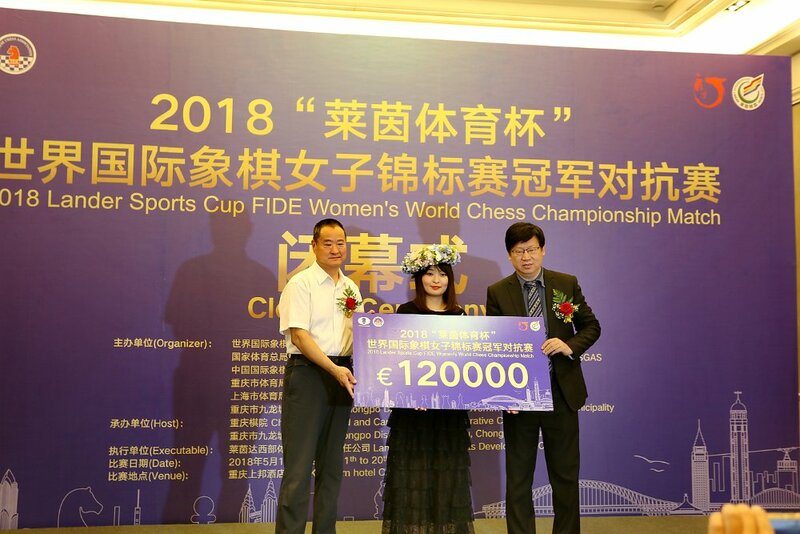 2018 FIDE Women’s World Chess Championship Match had the 8th game inside Chongqing Sun Kingdom Hotel. The challenger Ju Wenjun and the current champion Tan Zhongyi draw after three hours fight, the score in the match is 4.5:3.5. Ju Wenjun keeps on leading with one point ahead. Ju Wenjun played white today, she went for 1.d4 which she is quite familiar with. Tan Zhongyi made changes so to avoid the Catalan opening. After 4…f6 and 5…g5, Tan Zhongyi showed her intention to fight. Just like she said at the post game conference, not too many games left and she was still one score behind,she has to fight. Even though this variation might bring the Black into danger, but she believes it definitely worth a try. Ju Wenjun said, logically speaking, 4…Be7 or 4…Nf6 will be better. She wasn’t prepare for the variation, the white would be better if had been prepared. Apart from that, Tan Zhongyi is not happy with the move 7…Bd6 when she is reviewing the game, it made the Kingside a weak spot.7...Bg7 could be better.Mr.Ye Jiangchuan had the same opinion, should have Nh6-f7 done before considering where the bishop to go. facing with the unfamiliar variation and the heat from Tan Zhongyi, Ju Wenjun coped pretty well. 11.e4,17.0-0-0，she played stable，controlling the initiative all the time.Though the computer suggested white to play 19.h4 instead of 19.c5, will bring more advantage to white, both of them believed that Ju Wenjun's move 19.c5 was even better. 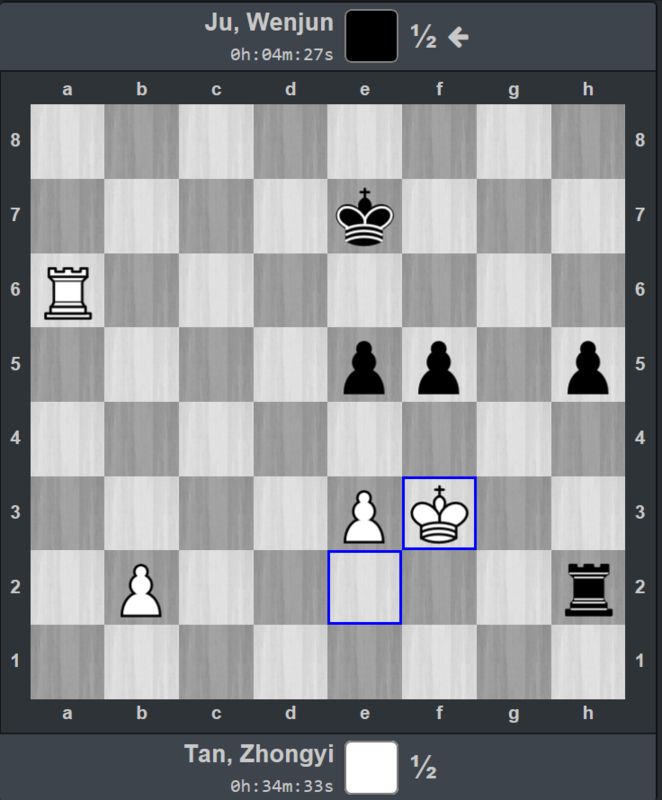 The most crucial moment was at 26th，When Tan Zhongyi played 26...Rxe5 actually was a blunder, gave white a great chance to win a piece！A simple and beatiful tactical combination 27.Rxe5 Nxe5 28.f4 Ng4 29.Qxf6 Nxf6 30.Bc4!,will bring white to win. But regrettably they both ignored. With the hint given by computer at the post game comference, they awared of the missing chance. After that, they traded pieces on the opened center files and went to a equal ending, they agreed with a draw game. 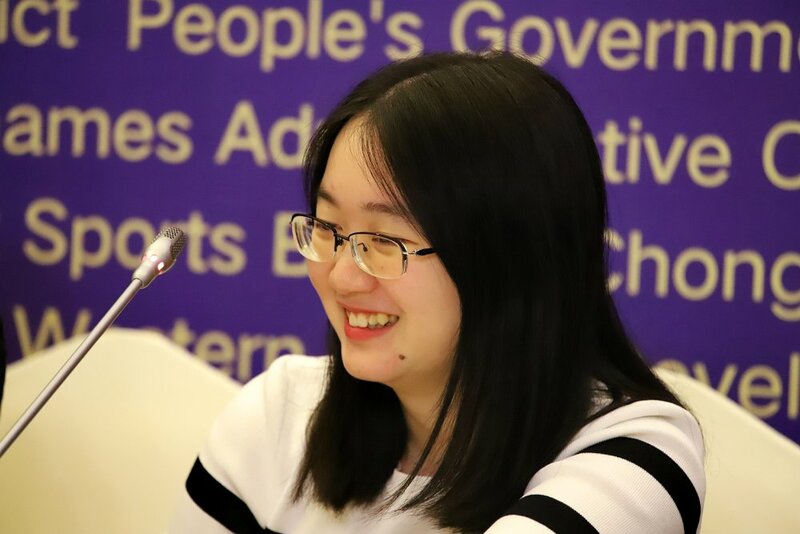 Interestingly, later at the post game conference ,when two players were asked by the journalist who is their favorite chess player, Tan Zhongyi thought for a moment with smile on her face ,then reflected ”Ding Liren”, whereas Ju Wenjun replied with careful consideration and answered: “if say that is the world champion, Kramnik is my favorite player”. So far, 2018 FIDE Women’s World Chess Championship Match have the last two games left. As the challenger Ju Wenjun has already reached match point, she has better chance of winning the title of the world's champion if she successful gets one point in the last two rounds. While to the defending champion Tan Zhongyi, only if she get one and half points to achieve the tie-break. on May 16 3:00p.m., the ninth round competition will be continued.